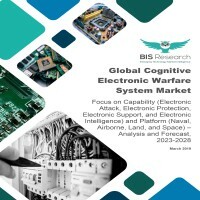 • A detailed competitive benchmarking analysis, which focuses on the ¬key market developments and strategies, followed by the top players in the market, has been included in this report, to analyze the competitive strength of the players in the global cognitive electronic warfare system market. The preceding figure illustrates the increasing revenue generation of the global cognitive electronic warfare system market for the forecast period, 2023-2028. The is expected to report revenue of $385.7 million in 2023 and is expected to grow at a significant CAGR during the forecast period.